Interestingly enough, a green bottle - except it's wrapped in opaque paper to prevent light penetration. Nice touch. A: A very murky sort of amber/orange pour. Large off-white fluffy head. Retention is great. Lacing is decent. S: I can smell it from the glass multiple feet away. Hop A-Bomb. Having said that, it's not the king of strong aromas. I think it's probably not 100% fresh. Fresh Hopsickle or Ruination or Devil Dancer is stronger. Anyway, mostly pine resin with a strong grapefruit presence. Good pineapple too. Get some lemons too. Mango? Apricot? The whole family is here. Surprisingly strong caramel malt too - not that it's overpowering, it's just that I'm surprised I can smell it at all. T: Wow, hop flavor is a lot stronger than the smell. It's pure oily, resinous hop juice. As mentioned above, lots of pineapple, mango, apricot and grapefruit. A bit of pine on the back end. Surprising sweetness bursts through and balances out very nicely. Hops are so strong, regardless, that it actually hurts my teeth. It's honestly delicious despite the strength. M: Pretty heavy, quite drying. O: I expected this to just be an unpalatable experiment in bitterness. But it's actually quite good! If you can get past the toothache it's a huge, juicy fruit bomb that is shockingly relatively balanced (if there were such a thing). Chilled bottle into a glass. Shared by nickd717. Thanks Nick. A: Pours a very sedimentary hazy golden body with very fluffy tan foam. Great retention. S: A very American barleywine aroma. Candied grapefruit, tangerines, orange, spice, pine, and herbal aromas. Malt is quite strong in burnt caramel and sugar cookie aromas. A little booze sting. T: Initially quite sweet: caramel, sugar cookie. Then hop flavors (but not a lot of hop bitterness) enters the picture: citrus, some pine, and a LOT of grass. The grass pulls into the aftertaste where it remains as a lingering mild bitterness. M: I expected more bitterness, not that I would have enjoyed that. It's a little boozy, which makes sense now that I see it's almost 10%. Kind of chewy. Moderate carbonation. D: It was interesting for the novelty, but on a pure flavor basis, this beer does nothing for me. Certainly nothing I'd go out of my way to drink again. Had on tap at Bulldog New Orleans. Served in a goblet. A- Pours a light brown color with a 1/4 inch beige head that doesn't retain long before becoming a thick ring around the edge of the glass and a mostly full sheet of surface foam. Somewhat resilient lacing leaves small clots behind. S- Very sweet smelling with a shot of booze and actually not a whole lot of hop fume. T- Bitter but not as bitter as expected. 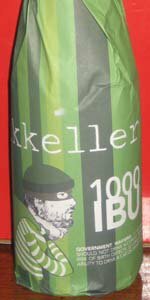 It's actually got more of that sugary sweet malt flavor Mikkel's known for in his IPAs. Plenty of pine, wet grass and heavy earthiness. The hop bite lingers a while but doesn't scream of a high IBU score. Only after multiple sips in a row do I go "this sure is bitter." Subtle notes of grapefruit and lemon come through in the aftertaste. OK, now it's starting to creep up on me. Usually my palate becomes fully acclimated to the alpha acids at this point, but not with this beer. Every sip I take leaves my tongue reeling. M- Sharp, dry and oily with medium-low carbonation and a fullish body. O- This beer started out with some enjoyably contrasting balance but, halfway through, the bitterness slashed its way through all the other flavors making it pretty much all you can taste. I can see what Mr. Bjergso was going for with this but I couldn't see myself having another 10 oz. pour of this. On-tap at the Local Option. Poured into large mouth wine glass. This beer pours a translucent cherry red with hints of amber at the bottom of my chalice. It has a two finger off white head that is dense and spongy. The smell develops to from a bouquet of sweet pine, citrus, cherry, mango, watermelon, and a slight cannabis infusion. Very nice and welcoming. I wish I could say the taste was as complex and intriguing as the smell. The truth is that maybe it is, but I could not get through the hops to find out. It starts out with a nice pine and citrus hop flavor before the drinker is almost knocked off their stool by the infiltration of hop bitterness that follows. Each sip begins and ends the same, until the end of the drink when there is almost nothing but the taste of IBUs. Seriously, this beer gives the IBU an actual associated flavor. Unfortunately it isn't too desirable. I could not find any malt flavors, but I'm sure they were there for those with more attuned taste buds. The beer was palatable and an interesting exercise in both the capabilities and limits of hop exposure. I don't think I will rush back for another, but certainly not an experience I regret. Look: Thick, dark amber with a slightly orange twang, a 3/4 inch white/cream-colored head. Taste: Follows nose with a blast of bitter piney hops with mild earthiness. Some malt sweetness follows but the beer, unsurprisingly based off its name, is totally dominated by very bitter hop flavor: primarily pine. Feel: The beer is thick and medium carbonation. The bitterness lingers for a very long time afterwards with the malt sweetness a little more noticeable after finishing each swig. Overall: This beer delivers what is promised. This is extremely bitter and a super hop bomb. A nice refreshing DIPA. Thanks to the Hulmeville Inn for this one. Poured into a tulip. Pours a hazy brown with alot of sediment. Almost equivalent to muddy brown water with a great light brown heading. Smell is more of a malty beer. All roasted and a bit of a bitter hop aroma but not what you would expect for a 1000 IBU beer. Taste again more of the same a heavy malty taste with alot of a burnt caramel leaving's of sediment. Again decent hoppiness but 1000 IBU's I would question it just doesn't seem to be that bitter. Mouth is medium bodied with great carbonation, does leave a heavy oil hoppiness that makes a film on the palate. A decent IIPA but nothing spectacular. More of a malt lover IIPA with a decent hop kick. A- Opaque brown with orange-red glow. Thin, off-white head and great lace. T- Pine, resin, apricot, sharp grapefruit/citrus, brown sugar, tropical fruit, strawberry, brown sugar, grainy/bready, burnt sugar. Lingering grapefruit bitterness should please fellow hop-heads. M- Big. Chewy, syrupy, thick with the perfect amount of carbo to back it. I'm not usually one for beers that I would describe as "chewy" or "syrupy" but with the intense resiny hop character it works well. Also there's a bit of alcohol warmth, but it is pleasant and not overwhelming. D- Drinkable for the style if tons of bitterness doesn't phase you. (and if bitterness does phase you, you have no place buying a beer that is named 1000 IBU) There is some alcohol warmth, but as is stated above it is pleasant. this is an epic brew, easily the best ipa ive ever had, including heady, pliny, and all the rest of them. this is sensationally powerful and different, and is deserving of much more recognition. it pours a perplexingly dark copper color, more red than brown or orange, with some yeast floaters and a prominent off white head that leaves so sticky lacing on the glass. the nose major. it smells like ive put my face in liquid hops, its so oily and dank, bitter as hell, but also supported by some darker malts that give the beer a real mature and sophisticated aroma. the flavor is like nothing ive ever tasted. its high alpha for sure, just like fresh hops through a juicer, but somehow concentrated, its piney mostly, but theres some really bitter citrus in there as well, like the pith from a grapefruit. its got some malt backbone under all of the hops, but it plays only a supporting role here. the hop profile of this beer is so intense, its so fresh, and man oh man is it bitter. this is my fantasy playing out, i swear to god its so so so hoppy. the mouthfeel is perfect, the body is full, the carbonation is just enough, and the hop bitterness is almost caustic, almost burning the insides of my mouth. its not puckery like a sour, but it literally is contorting my face somehow. the alcohol is strong but it fits in nicely. i taste this even half an hour after my last sip. its impossible to describe how good this really is. easily the biggest, meanest ipa out there right now. incredible! Well this was an unexpected one. I fell in love with this beer, and will hopefully be able to pick some more up soon. It is intense, and is one of the closest beers to Pliny the Younger that I have experienced to date. Its still not as good, but cured my hop craving for a bit. The appearance is a cloudy murky orange, with a darker amber brown heart. The head is fluffy and sticks around for the entire tasting. This thing is awesome looking and has the thickest oily legs that leave their mark. It also has a medium amount of lacing. The head is almost gooey, never really leaving and just staring you in the face. It is not clear at all, but still oily and thick. The bubbles from the carbonation struggle to make their way up, which reminds me of Younger. The smell is like falling into a pile of pine needles. Pine, caramel, sugars, mary jane, and more pine. Beautiful. Mouthfeel just kills everything that you have in your mouth. It destroys the palate with its oily hop bite. Incredibly drinkable, but a bit expensive. This beer was surprisingly good. Well done.